When thinking of Christmas and getting excited about the festive season, our minds always seem to wander back to the mountains of cheese and pork pies we consume at this time of year. Don’t get us wrong, they’re year-round foods, but in front of a fire, with some cranberries and the Christmas tree lights glinting in the background, there’s little more festive! But what components make the ultimate cheese board? 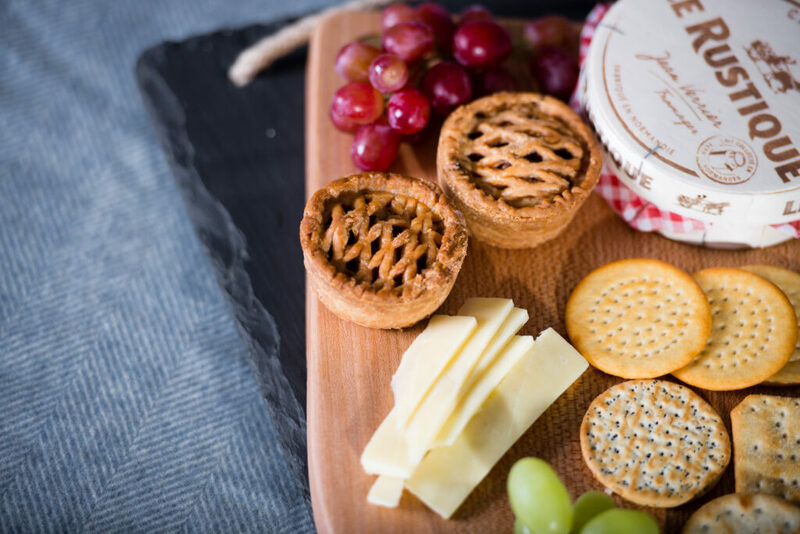 For a cheese board that will be shared, it’s easier to go with the smaller pork pies – mini, mini pork and pickle and snack pies. The pork and pickle mini pies are the one’s we gravitate to simply because they add another flavour to the platter – on top of the cheese and crackers, it’s important to allow the flavours to all shine through. For the cheese, we always favour a mature cheddar, so this is always a feature for us. The Camembert is a cheese board staple – perhaps you could also warm up a baguette in the oven and slice into thick chunks for dipping. Along with the crackers, it’s always a favourite and we love the different varieties of textures – a soft cheese with a harder crusty bread and the slightly harder cheese with a softer water cracker. Additional to this – add in your favourite cheeses and scale them up to how many people will be enjoying it! Try adding a dense and pungent blue cheese or a buttery bloomy-rind cheese which will add another flavour and texture. That being said, don’t put cheeses on the board just because you think you should have them – if you know you don’t like blue cheese for example, then you don’t need to add them in – your guests will just be happy there’s a cheese board, they won’t be fussy! For accompaniments, what sauces do you like with your cheese board? We lean towards some Branston Pickle and a bit of balsamic vinegar. There’s always some grapes on our cheese boards, along with a few sun dried tomatoes which compliment mature cheese beautifully and a few olives, mainly because these are always a huge hit with the cheese and a balsamic glaze, they blend together beautifully. Make sure to let your cheese chill out of the fridge for a few minutes before you serve – otherwise their flavours are slightly stolen and you can just taste the cold! Do we even need to consider what we’d drink with our cheeses? Wine of course! With so many reports as to what cheese would go with which wine, there’s a few things we can simplify it to. Malbec is an red intense wine which balances out the sharpness of an aged cheddar so if your board is mainly of the cheddar variety, we’d reccomend you choose a Malbec. If you’re partial to a bit of brie, a glass of Pinot Noir should be in your hand – it’s distinct flavours pair well with brie whilst being careful to not overwhelm them as they remain light. For a Camembert, we’d say you need to try a champagne – the bubbles compliment the creamy cheese perfectly!